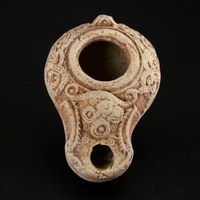 Roman figural terracotta oil lamp with single handle. The discus is framed with three concentric rings. In the middle is a high profile depiction of a winged lion with raised forepaw on a ram's head. Maker's mark on the bottom: MNOVIVST. Ex private Belgian collection, acquired in the 1960's. The maker's name MNOVIVSI (sometimes also marked as MNOVIVST) is from M. Novius Justus, a well known Tunisian oil lamp manufacturer who produced oil lamps in the Roman colonies of Northern Africa in the 2nd century AD (present day Tunisia).